The AeroPilates Reformer 435 features the Cardio Rebounder - a vertical trampoline to provide a cardiovascular workout without jarring or putting pressure on your joints; the foot bar which allows you to perform traditional Pilates exercises to help strengthen muscles, improve posture, flexibility and balance; four black cords allowing you to adjust levels of resistance, making it a simple-to-use way to get a comprehensive and varied workout. Three workout DVDs help you every step of the way and the popular workout chart give you everything you need to workout with confidence, as if you had your own personal instructor, in the comfort of your own home. The AeroPilates 435 reformer also folds flat for easy storage The machine folds down to just over half its assembled size, meaning it is easy to store and doesn't take up much space, and has large wheels making it easy to move around. It arrives almost fully assembled; all you need to do it attach the wheels and end caps, fit the risers and you are ready to go. Reformer pilates is designed to contribute to improving posture and co-ordination, strengthen, dynamic stability and create a balance between strength and flexibility. 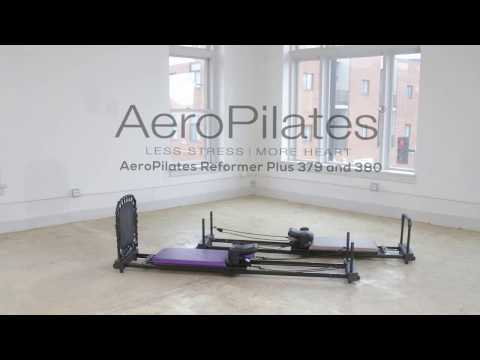 Suitable for all ages and abilities, the AeroPilates reformer allows you to do low-impact cardiovascular exercise, meaning less stress on your joints. Built to last - made of high-grade steel, the reformer is strong and sturdy; you can even jump up and down on it, and its build quality gives a maximum user weight of 300lbs / 21st 6lbs. Available with either a Grey or Purple cushion.